Adult coloring books. It’s a craze! I must admit, I buy into the hype! I have always used creativity as an outlet. In fact, this blog was born as a result of my needing a creative outlet while I suffered through severe postpartum depression after the birth of my daughter. I even read an article now about how psychologists consider coloring to be a great alternative to meditation. I totally agree. Unfortunately, I have been struggling with postpartum depression again since having a miscarriage (it’s unusual, but, sadly, it is very real, I assure you), and lately I have been wishing that I could do some art therapy. We can’t afford that right now, so instead I signed up for an adult art class at the local rec center and bought myself a fashion doodling and coloring book. Those things, along with my hoard of craft supplies, will have to do for now. I am an Usborne Books & More Independent Consultant, and I have noticed that they have the coolest selection of coloring books, many of which are extremely adult-friendly, and they range in price from $5.99 to $19.99. Most of the coloring books on this list are $5.99, which is especially cheap for an adult-quality coloring book! There are also pocket sized doodling books that fit perfectly into a purse, including a small version of the fashion book I got for myself! 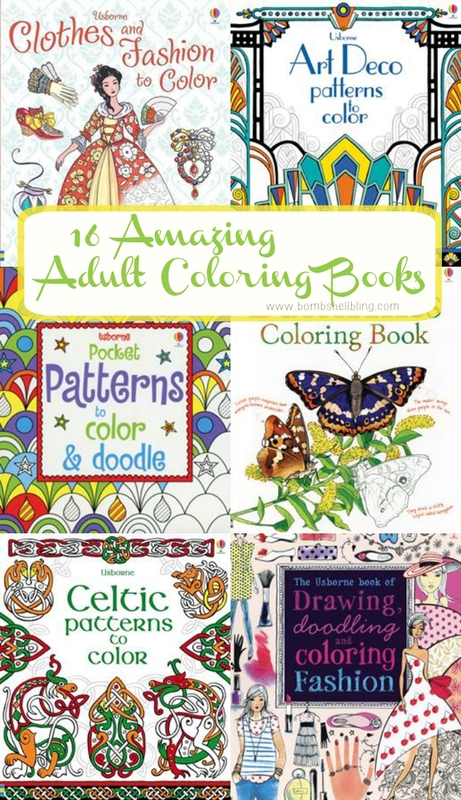 Today I want to highlight 16 awesome adult coloring books from Usborne Books & More site! The shipping is $6 flat rate for an order up to $75, so let me know if you need recommendations — you may just want to throw in a few extra books as well! Of course, these books would also work well for older children, and there are tons of great coloring and activity books for kids as well! Be aware that some of them have some of the pictures pre-colored/started as a guide to accurate colors in nature and to help get creativity flowing, which is especially helpful for those who may not be quite as artistically minded as others. Now let’s take a look at some amazing adult coloring books!! Stope stressing over big goals and start celebrating your small victories!